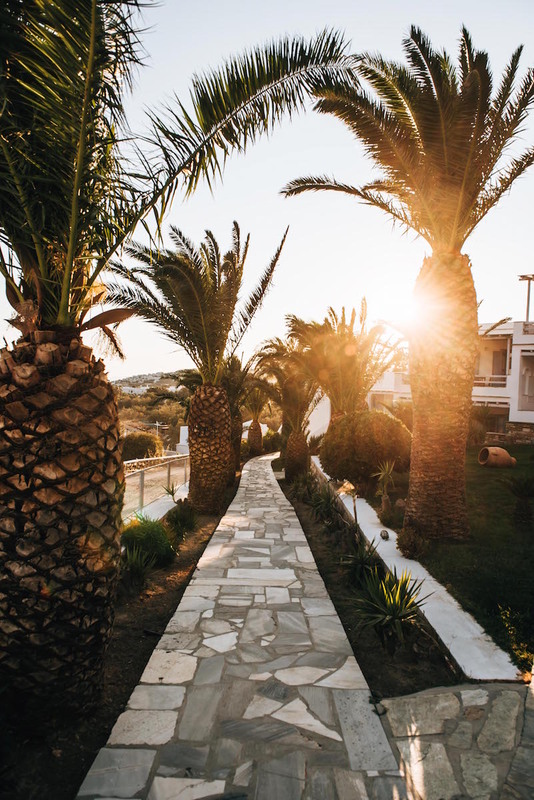 It’s time for island hopping in Greece! After Andros, the island of Tinos is next. 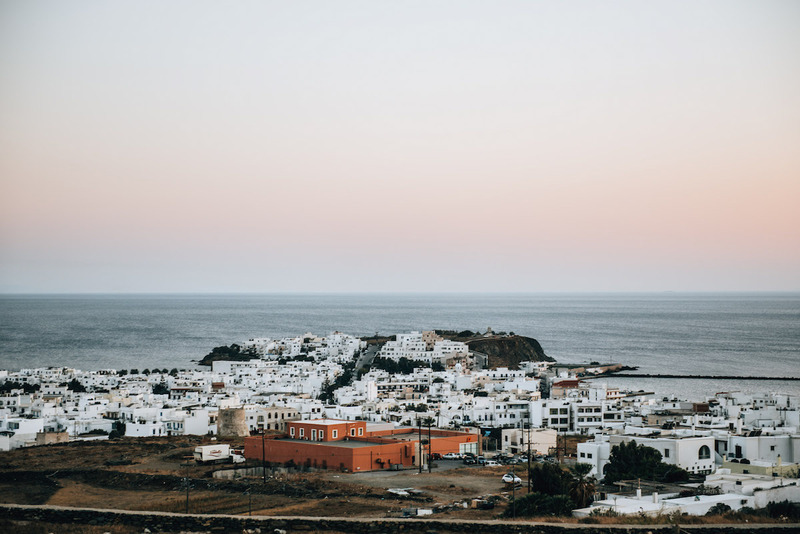 Although the two Cyclades islands are so close to each other, they are much more different than imagined. 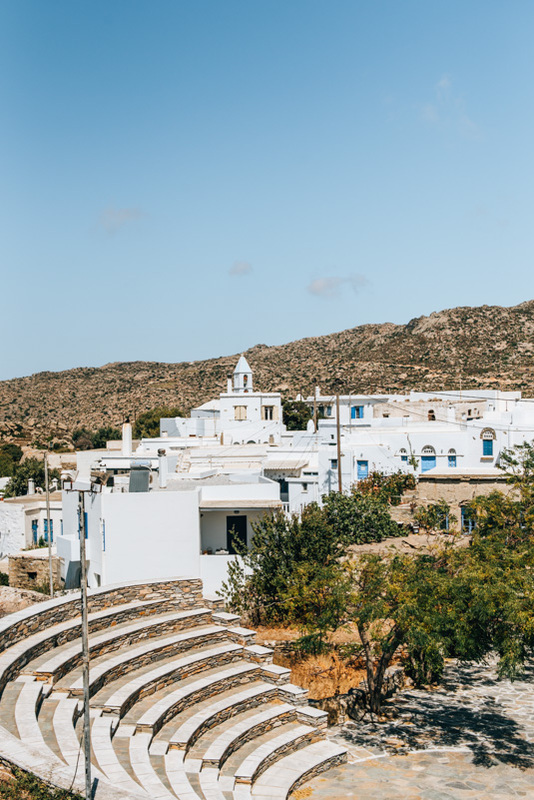 Tinos is sparse and less varied in landscape, but has the nicer villages. 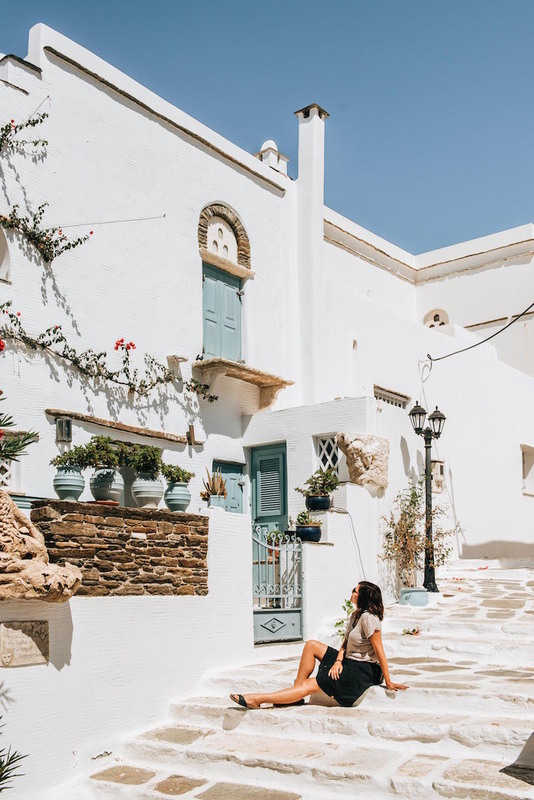 To be more precise, we discovered the most beautiful village of Greece in Tinos. 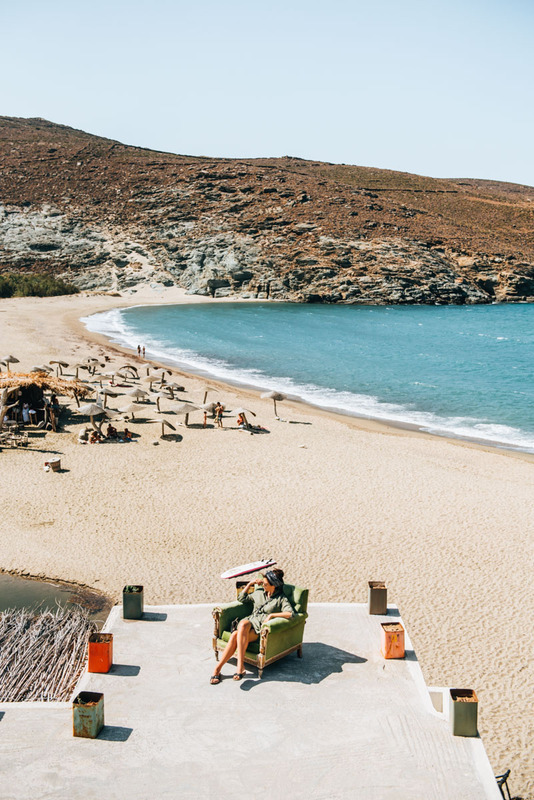 But first things first: Here are our tips for a holiday on the island of Tinos in Greece. 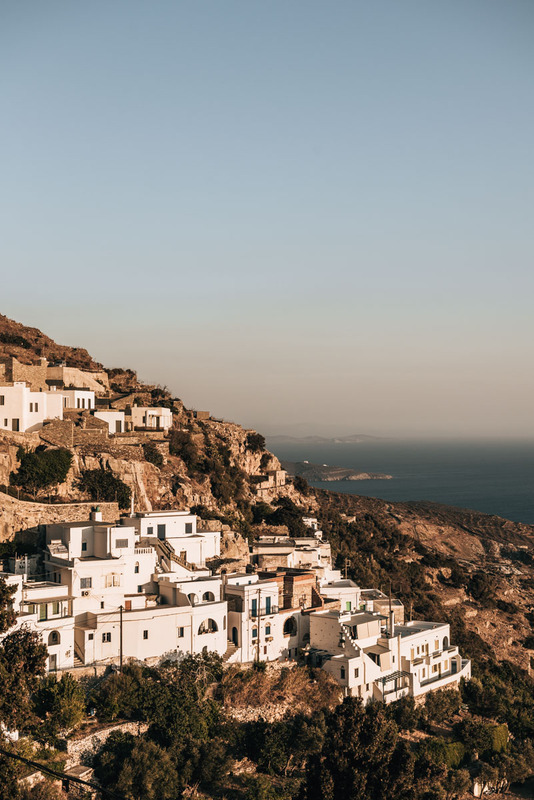 On the Cycladic island Tinos – as well as on the neighbouring island of Andros – there are officially less than 10,000 inhabitants. 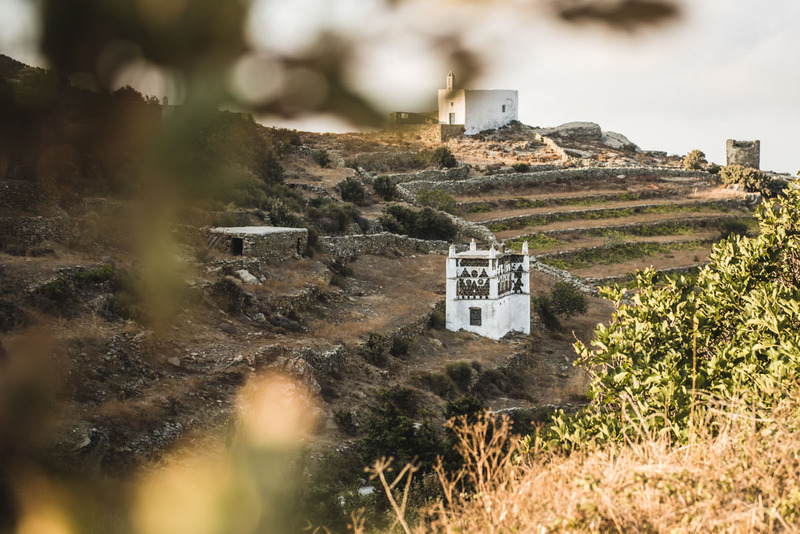 Tinos is better known as Andros for a main reason: The island is the most important Marian pilgrimage in Greece. 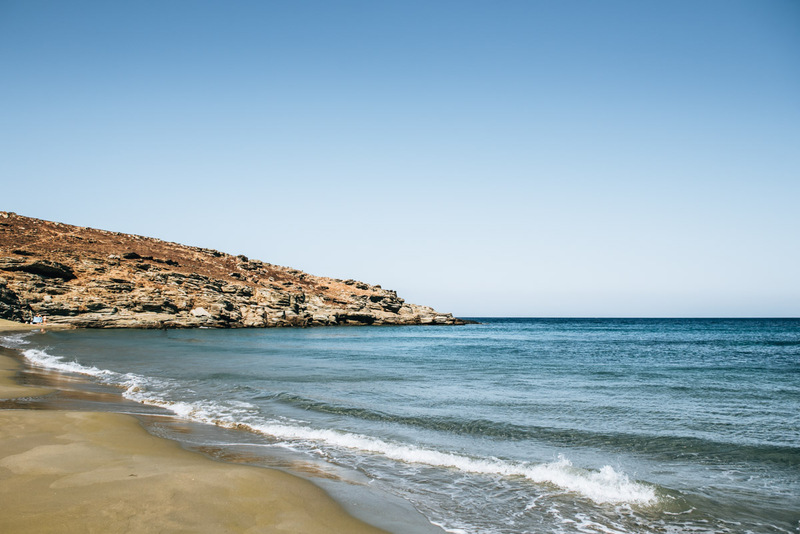 According to Greek mythology, Tinos is considered the birthplace of the wind god Aiolos (by the way, the wind god lives up to its name, but more about that later). 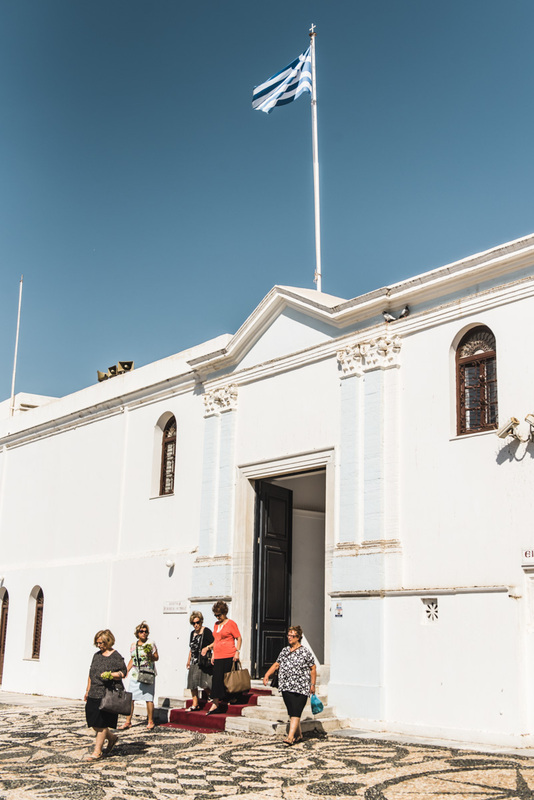 Tens of thousands of believers travel to Tinos, more precisely to the Sanctuary of Panagia Evangelistria. 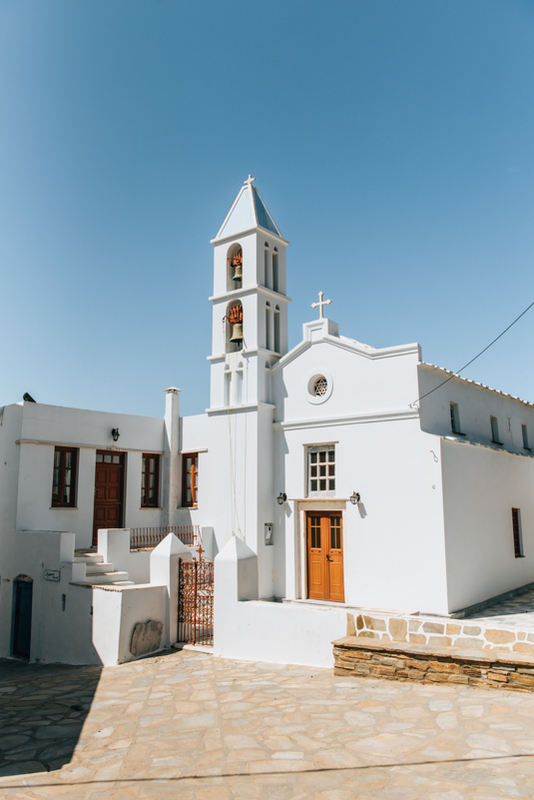 And even on regular days, the old town of Tinos resembles an open-air church: incense, icons and statues of Mary as far as the eye can see. 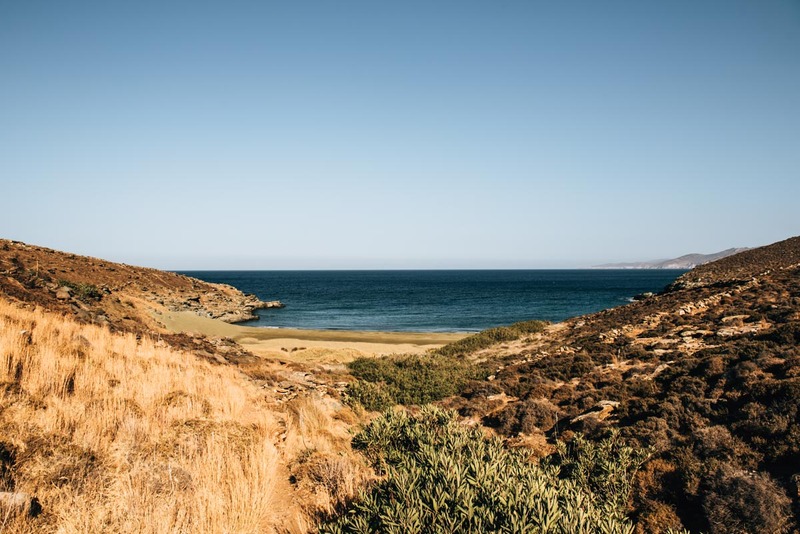 The rest of Tinos is a combination of barren, typical Greek landscape, beautiful villages and idyllic, partly deserted bays. 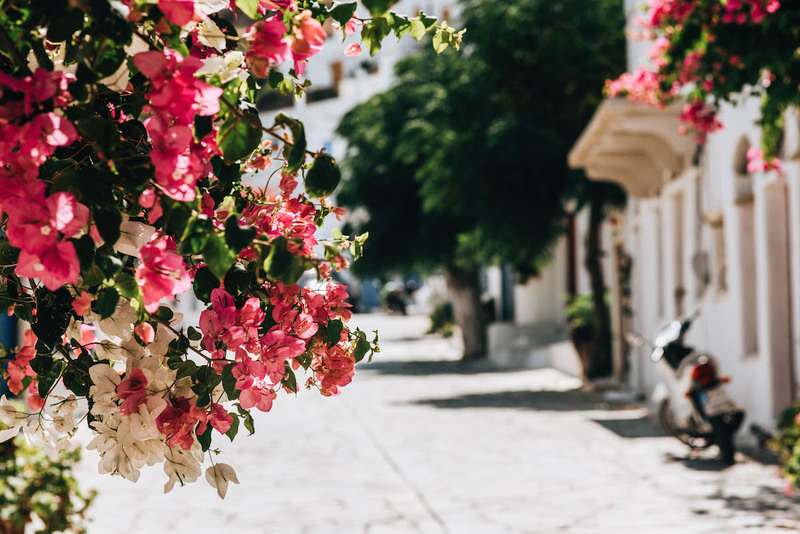 Although there are more tourists on Tinos compared to Andros, the island has retained a very authentic character. 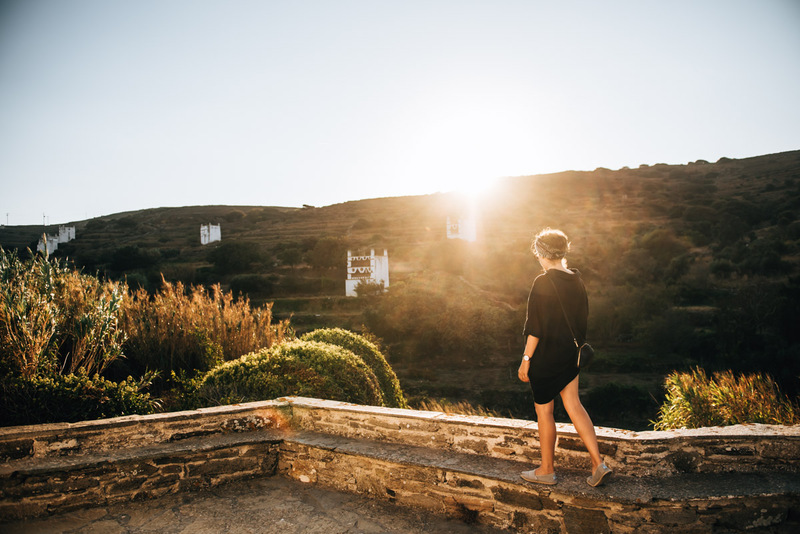 If you are looking for a very authentic island with great beaches, but you do not want to miss out on some touristic infrastructure, then you will definitely feel at home on Tinos. However, one thing is always present: wind. 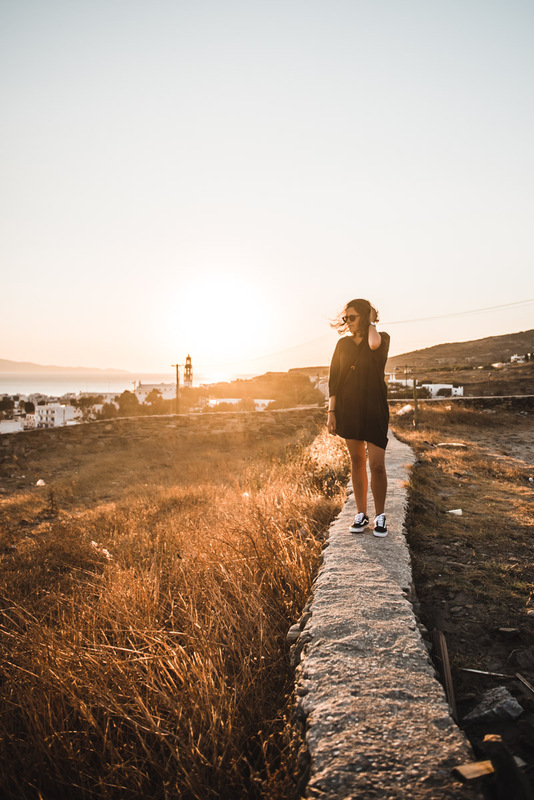 Tinos is considered a very windy island and the “Meltemi”, the Greek wind blows sometimes pretty neat. 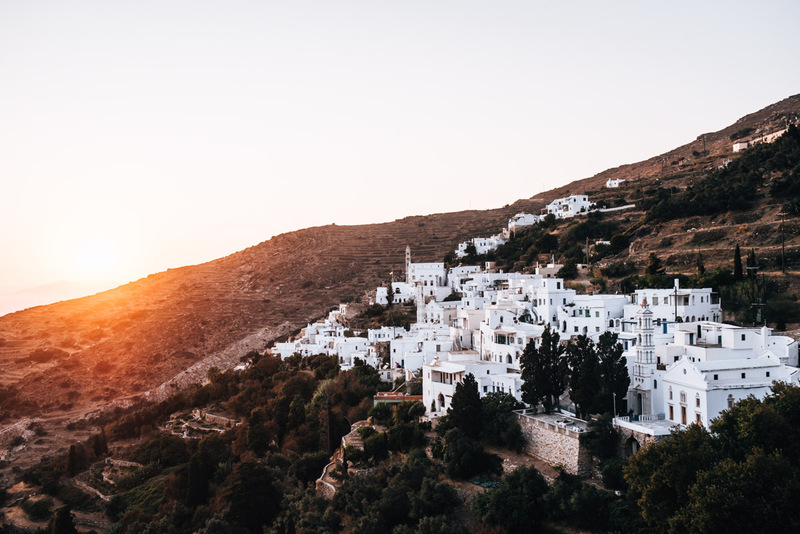 If you are travelling to Tinos, you will land in the capital of the island. 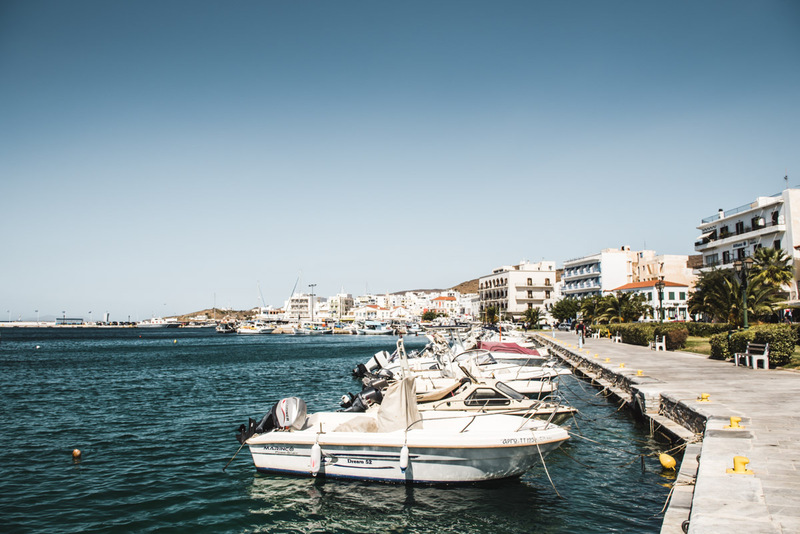 All ferries to Tinos arrive here, albeit a few hundred meters outside the city center. “Chora”, as the capital of a Greek island is typically called, is located in the southwest. 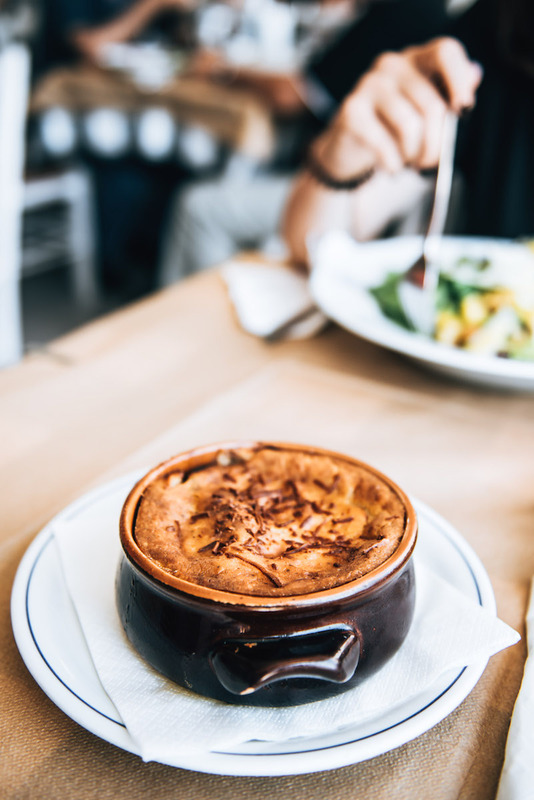 We felt very comfortable from the very first moment on because of the long waterfront, which is lined with restaurants and coffee shops. There is a lot going on here – especially at weekends – where seats in the restaurants are rare. Anyway, in Chora we always enjoyed sitting in one of the coffee shops, sipping our beloved Freddo Cappucchino. Chora is especially famous for the pilgrimage church of Panagia Evangelistria, perched on a small hill. From the shore, two streets lead to the church: One of them is a pedestrian walkway that leads past countless of religious shops. On the other street, a carpet is rolled out for the pilgrims. 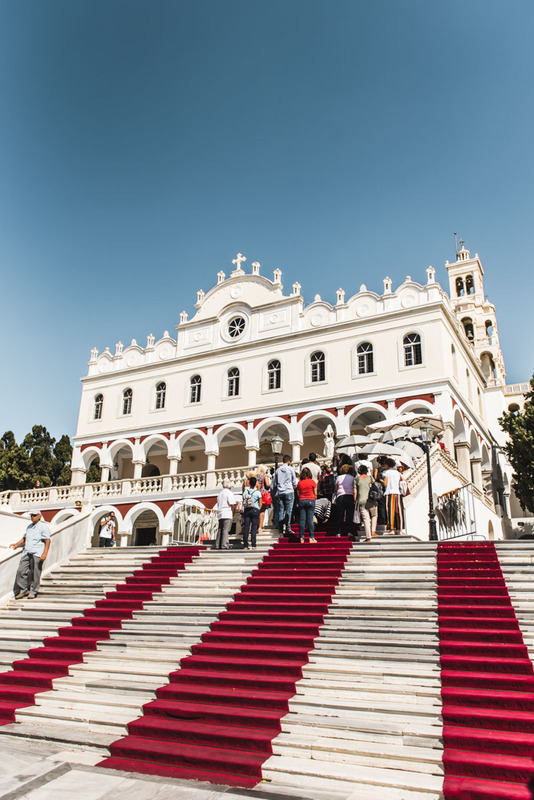 Believers come to Tinos to take the ascent to the pilgrimage church on their knees. We were impressed by the many small villages in Tinos. They are all very well maintained and beautiful both from a distance and from up close. If there is such a thing as the most photogenic village in Greece, then this must be it! 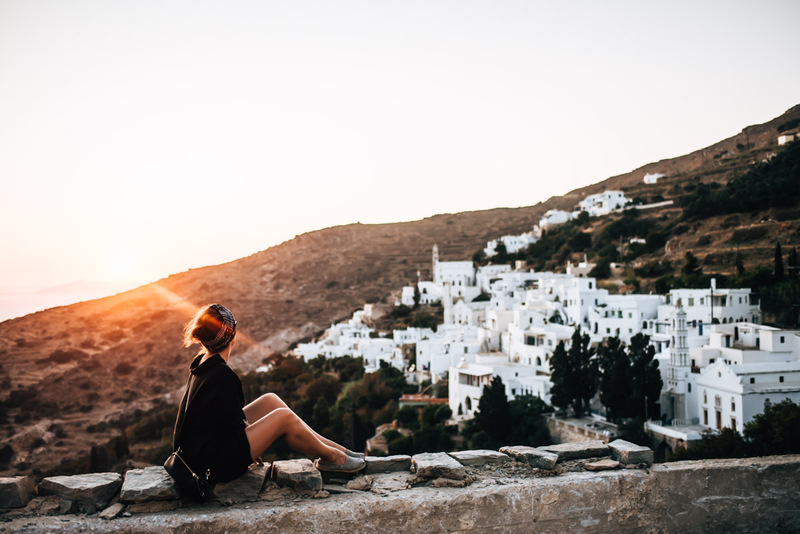 Pyrgos is located in the north of Tinos and we really enjoyed it. All the Greek stereotypes come true. White houses, blue shutters and blooming oleander. There is a fairly busy square in the village with restaurants and coffee shops, where a lot of domestic and foreign tourists are frolicking. The remaining streets, however, you have them almost for yourself. 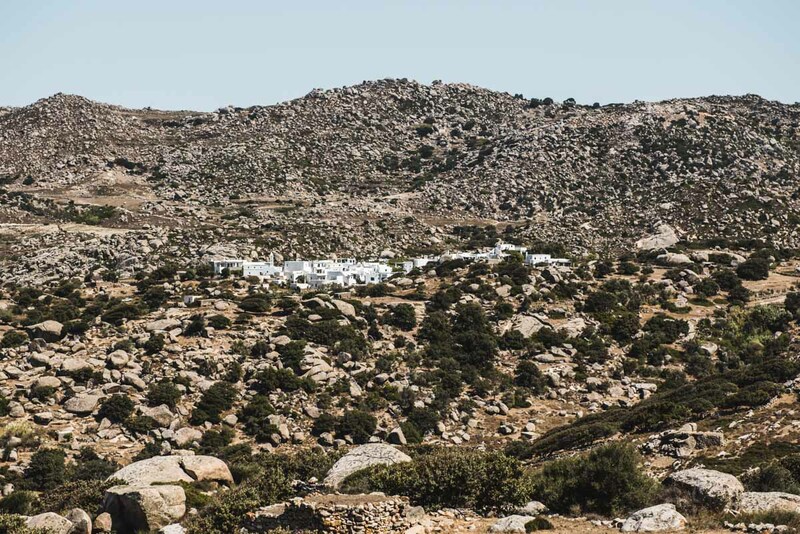 The barren inland of Tinos looks a lot like a lunar landscape. In the middle of nowhere, a white village suddenly appears: Volax. Only 50 people are supposed to live here. Volax is surrounded by gigantic, rounded boulders. The exciting thing about it is that many houses are built on or around these rocks. The village itself is tiny and quickly explored, but it is definitely worth a visit. Tinos is known for its pigeon towers which remained from Venetian times. You will find these very typical houses scattered throughout the island, but mostly around the village of Tarambados. If you park your car in Tarambados, after a short (signposted) walk you will come to a small observation deck, from where you have a great view of the famous pigeon houses. 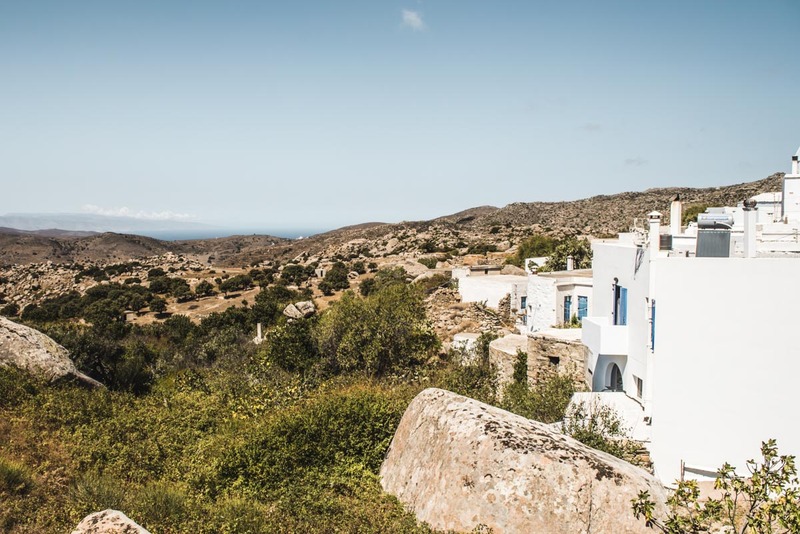 One of the most beautiful villages on Tinos is Kardiani. It is quite spectacularly situated on a hillside and for this very reason something very special. From Kardiani you also have a great view of the coast. Kolimbithra in the north of the island attracts especially the young and the young at heart. The waves on the north coast are sometimes quite high, so surfers come to Kolimbithra. There are two sandy beaches in Kolimbithra, although we were only at the larger beach. There are a few shade dispensers and a truck selling cold drinks – but there is not much more at this place. The smaller beach is supposed to be more crowded. Expect a lot of wind here! Very quiet and almost deserted was this sandy beach during our visit. 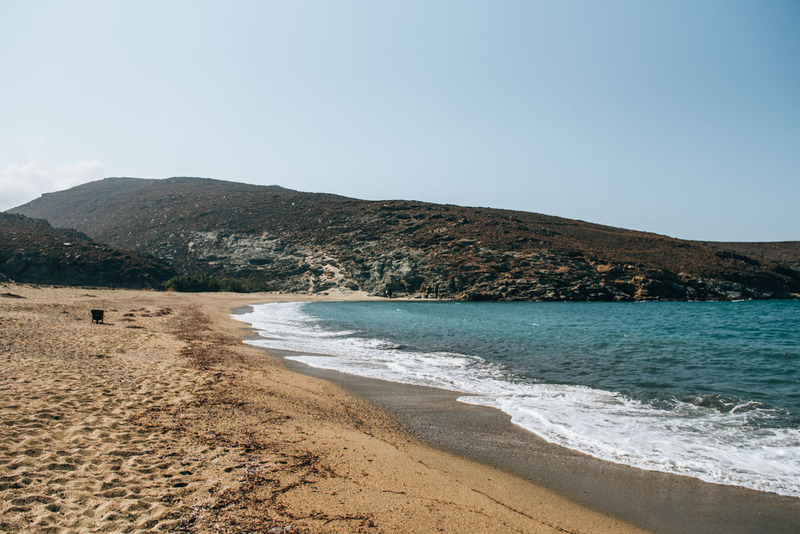 Pachia Ammos is located in the east of Tinos and is only accessible via a footpath. To get to the beach, follow the signs for Porto Rafael to the Country Club in Pachia Ammos. You park your car here and walk down to the beach (walking time about 5 to 10 minutes). At the beach of Pachia Ammos there is neither a shower nor a toilet or shops. You just enjoy seclusion. The water here was very quiet. 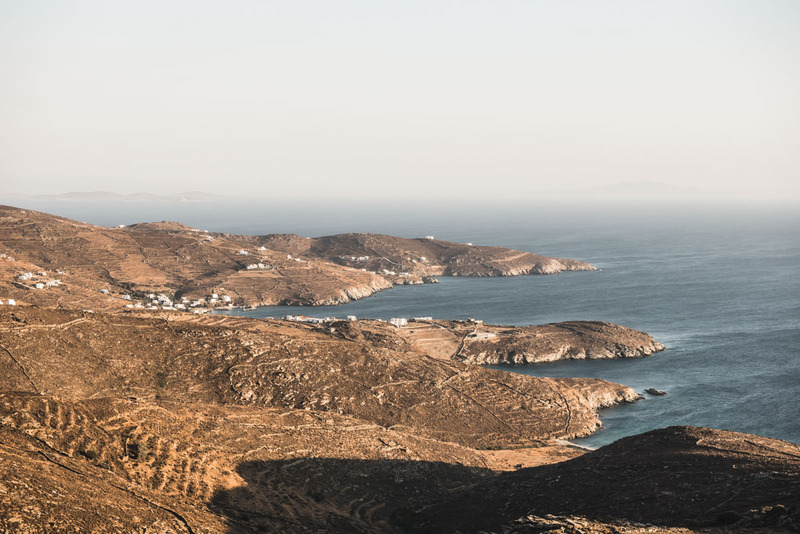 The Exomvourgo is a mountain on Tinos whose summit can be reached by hiking. The best parking space is in the nearby village. From there you only have to hike up about 20 minutes to the summit. We felt it was unusual for tourists to hike up the mountain, but the view from the top is quite impressive. One word of warning: It is extremely windy up there! Despite 30 degrees Celsius in the shade it was pretty cool up there. 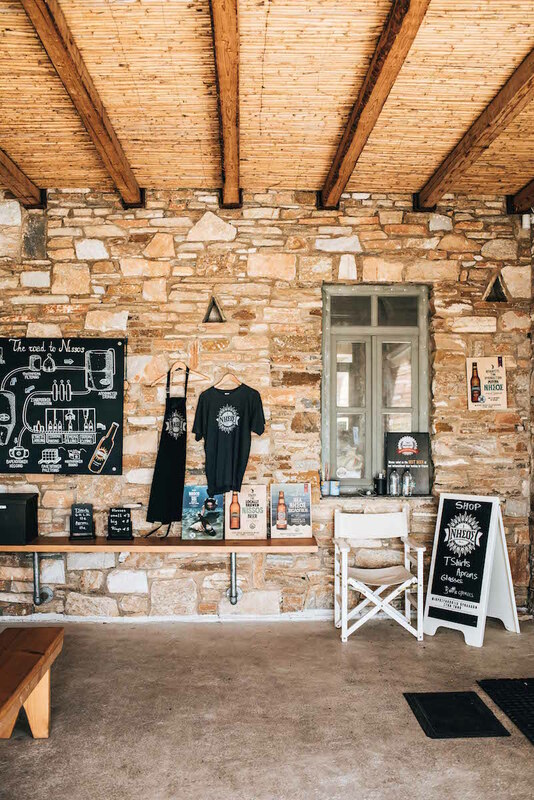 Something we can wholeheartedly recommend is a visit to the Craft Brewery Nissos. The brand was only founded in 2012, but it is no longer indispensable from Tinos and Greece. 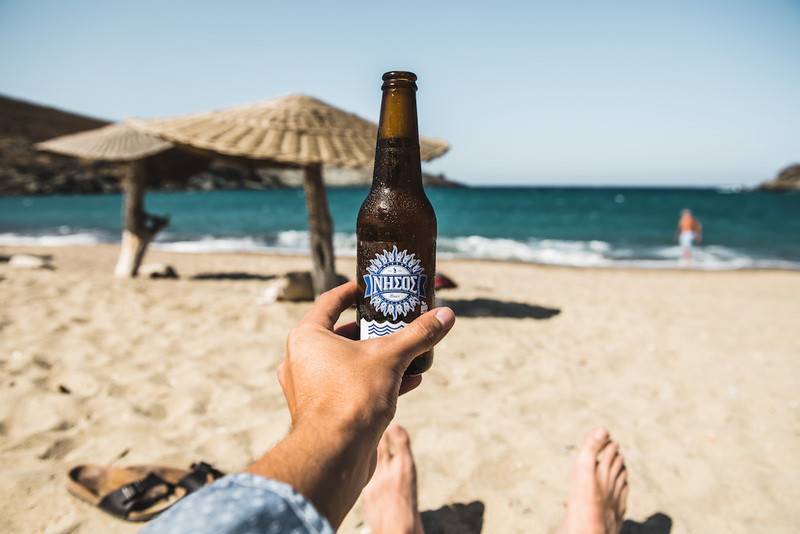 Meanwhile, the Nissos beer is even exported to Germany, Australia and many other countries. 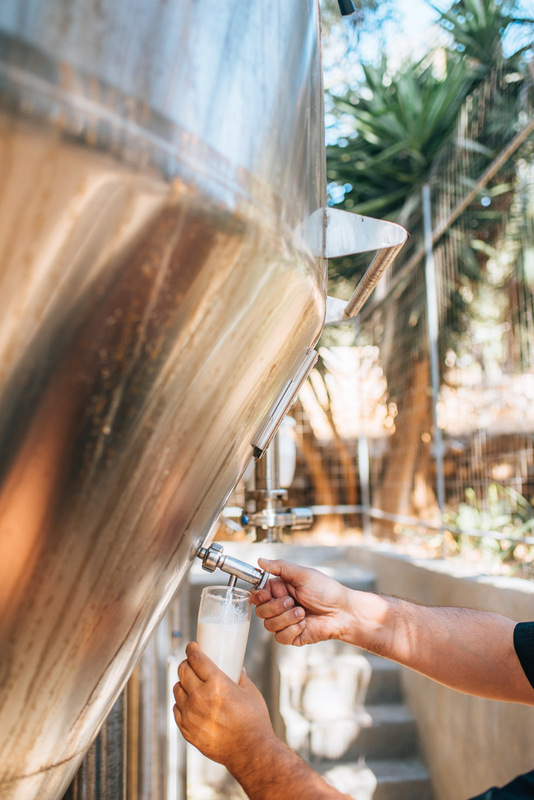 It is still only brewed in the Nissos brewery on Tinos, which can be visited as part of a guided tour. 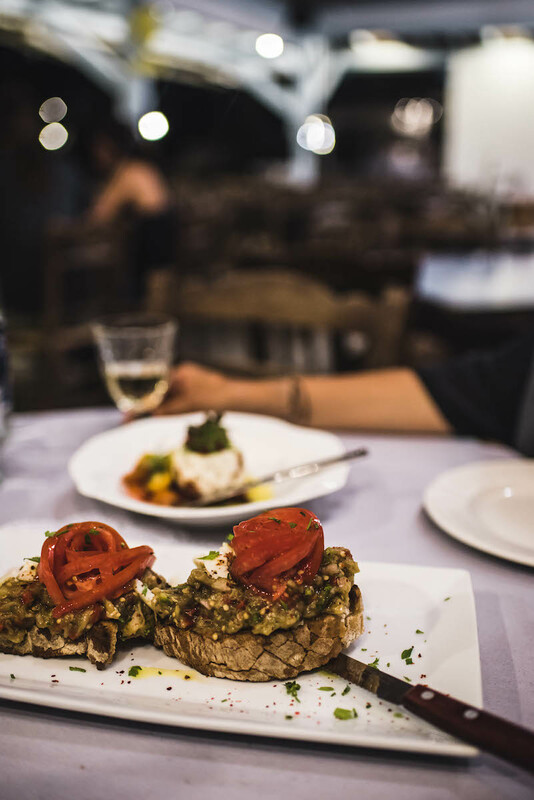 The restaurant Thalassaki is one of the most famous restaurants in Tinos. Fine Greek cuisine is served on a very high level. Accordingly, the price level for Greek standards is pretty high (a visit is of course still affordable, no question). We liked the fact that they serve many tapas (small dishes to share). The menu includes many fish specialties, but there are plenty of vegetarian options as well. The restaurant has a nice outdoor terrace and is beautifully located at the waterfront. How to get there: The Thalassaki restaurant is located in Isternia, down at the beach (not in the village). It takes about 40 minutes by car from Chora. At Isternia you have to drive down the serpentines to the beach. The Thalassaki is located directly at the water. We also had an excellent meal at the restaurant Mpouroú. The kitchen there can be described as classical Greek with creative influences. Romeo has found his beloved Moussaka on the menu. The covered terrace is very comfortable but quite dark (therefore forgive us the quality of the photo). The prices at the Mpouroú are less than the Thalassaki`s, but for Greek standards also on the upscale. 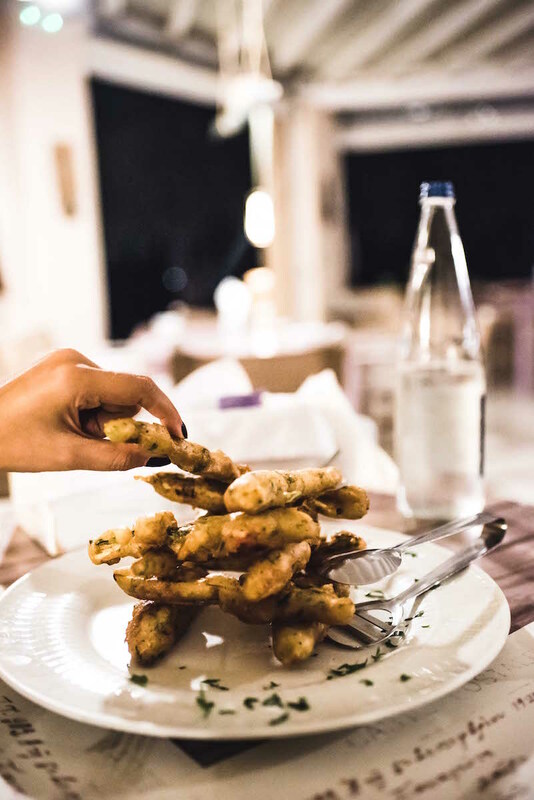 How to get there: The restaurant Mpouroú is located on the western edge of Chora along the coastal road. Coming from the old town, it is on the right side. We visited the restaurant Skouna for a quick lunch. It is located directly at the restaurant promenade in the capital Chora. We can not say anything negative. Both dishes we ordered tasted very good. For a sundowner we can highly recommend the Kaktos Bar. It is located right outside the capital Chora on a hill. Even tough you can not see the sun setting behind the city (but at the sea), the atmosphere is still great. In addition, we found the staff to be really friendly. We felt very comfortable and would come back again. Directions: From Chora follow the road uphill towards Ktikados. Look for the mill on the right side of the street. 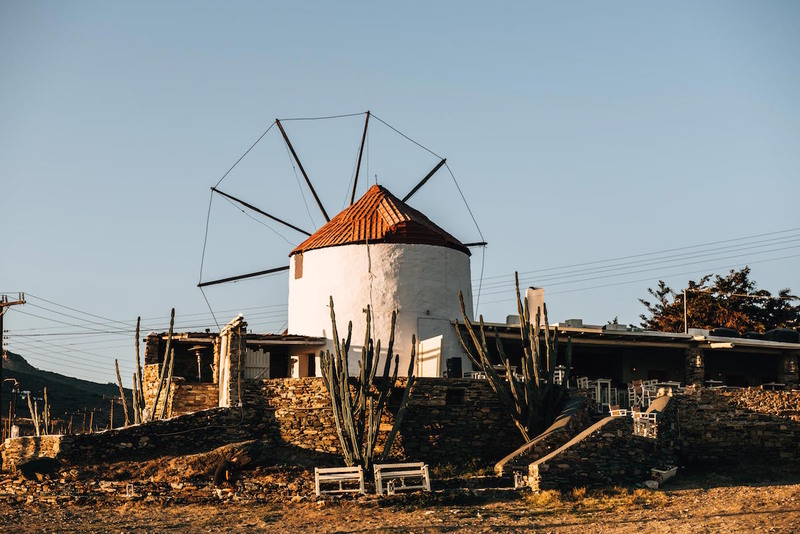 The Kaktos Bar is located right next to the mill, just 5 minutes from Chora. We stayed at the beautiful Hotel Porto Raphael Residences & Suites in the same named village. The hotel is rather small and manageable, but nevertheless pleasantly spacious with lots of greenery. It has a personal touch and is family runned. As a guest you feel in excellent hands, because the staff are incredibly helpful and friendly. Our room was very large and clean with a terrace overlooking the sea. 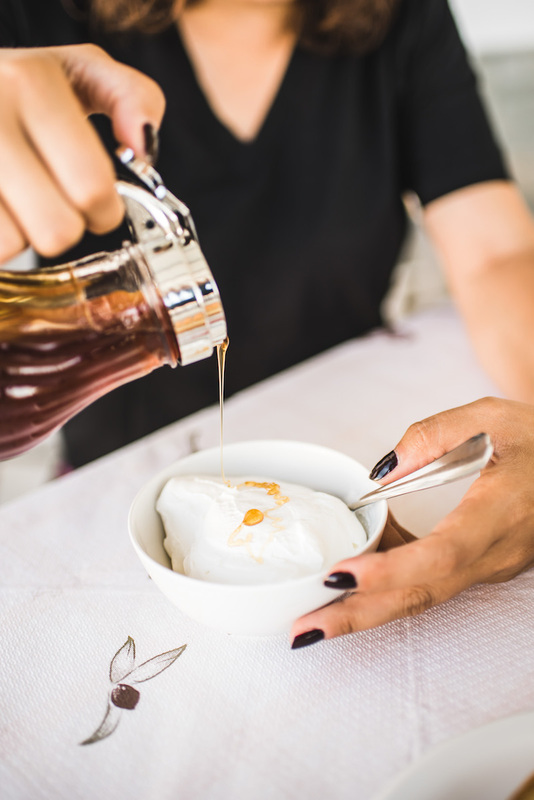 Since the hotel is relatively small, the breakfast is not offered as a buffet, but served to the table. The staff always bring a few classics (bread, freshly squeezed orange juice, homemade jams). But you can always express your wishes (cheese, yogurt, etc.). Also an espresso is e.g. easily possible. There is no pool, but the sandy beach of the nearest bay is just a 5-minute walk away. We would come back anytime! 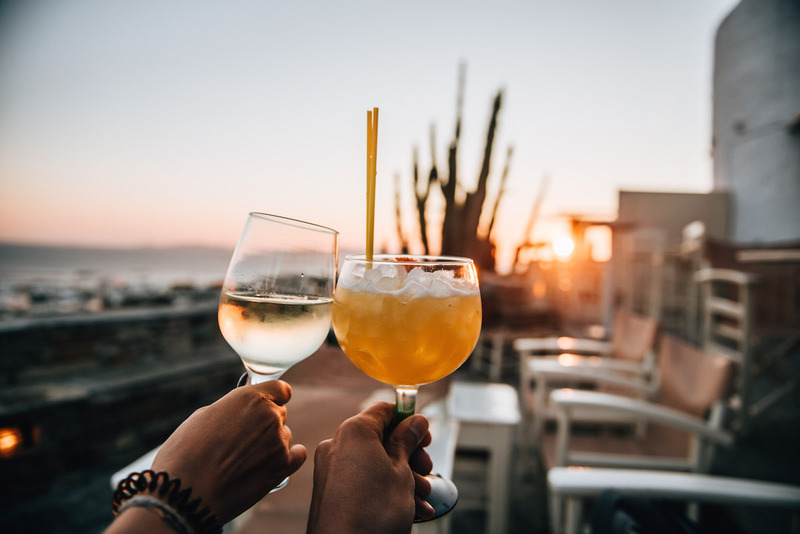 You could reach some restaurants within walking distance, but we would recommend renting a car (more about this later in this article). 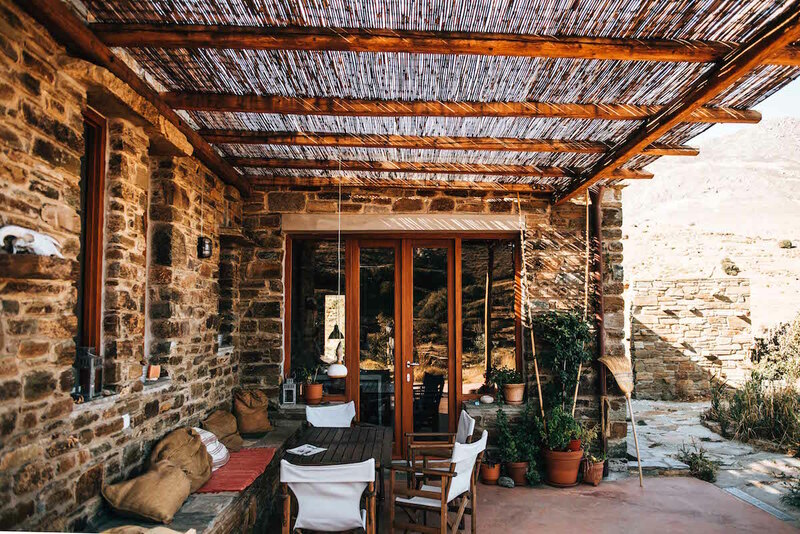 Although we did not spend the night at the Tinos Eco Lodge, we were allowed to stop by and meet the owners. Secluded in the hills of the island, the Eco Lodge is pretty impressive. For example, water needs are largely covered by rainwater. There are currently two beautifully decorated stone houses that are rented out to guests. If you are looking for a special place to stay, then have a look at the website! There is no airport on Tinos itself. The nearest major international airports are in Athens and Mykonos (the neighbouring island of Tinos). From Athens airport, you must first drive to a ferry port. Near Athens there are two: Piraeus and Rafina. If you are coming from Athens airport, Rafina is a little closer. You can drive to Rafina either by taxi (about 25 €; duration about 20 minutes) or by public bus (about 5 €; duration about 1 hour). The bus from Athens Airport only runs about once an hour. From the ferry terminal at Rafina there are several daily ferries to Tinos, mainly in the morning and afternoon. We have experiences with Fast Ferries as well as Golden Star Ferries. We can not say anything negative about the providers. The ferries were on time and we felt safe. 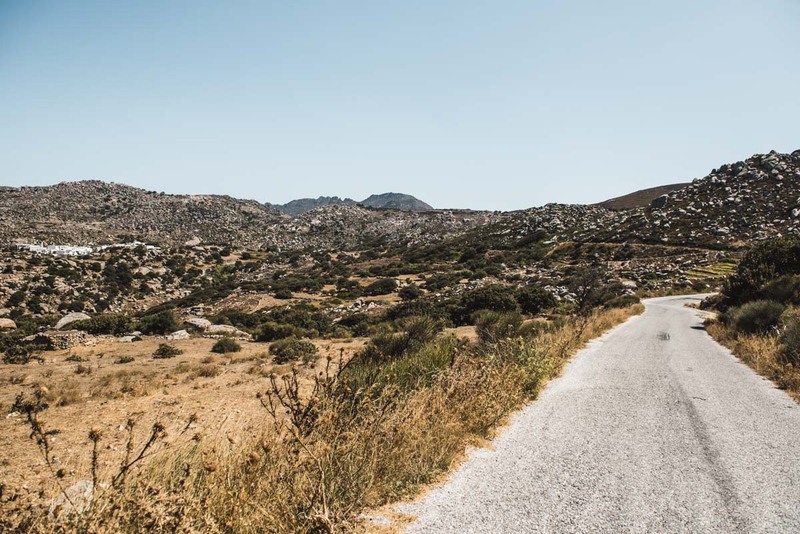 The journey to Tinos from Rafina is between 2 and 3.5 hours – depending whether the ferry has a stopover on the island of Andros. Golden Star Ferries offers a direct connection from Rafina to Tinos (Route “SuperRunner”). From Mykonos there are also several connections with the two ferry providers. The travel time from Mykonos is shorter, but the flights to Mykonos are often more expensive compared to Athens. 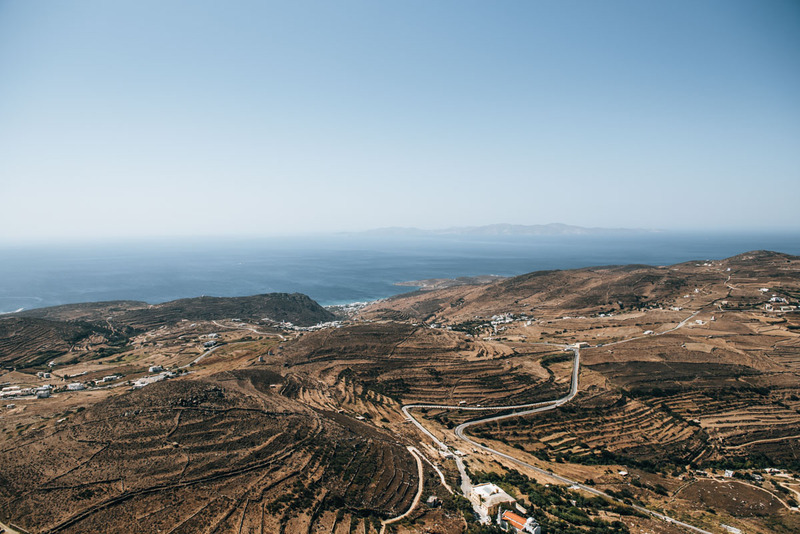 We would definitely recommend to rent a car on the island of Tinos. This way you can visit all places independently. The road conditions are relatively good. Apart from the fact that the roads are very winding, driving is pretty easy there. 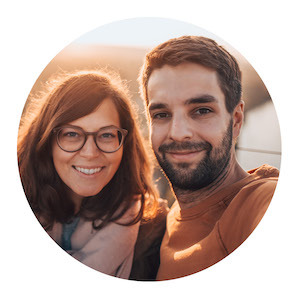 We rented our car at Vidalis and have only had good experiences. The car was small, but you do not want to drive there with a big car anyway. The staff are incredibly friendly and helpful. The company generally works very professionally. Parking is easily available along the roadside in many places on Tinos. In Chora, however, you can only park in marked parking spaces. We did not need an international driver’s license. 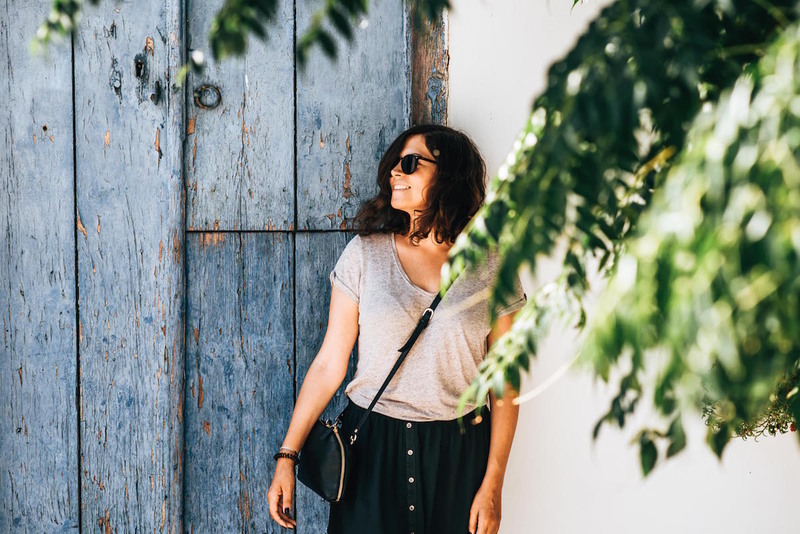 Transparency: We were invited to this trip by Discover Greece. Our opinion remains unaffected. 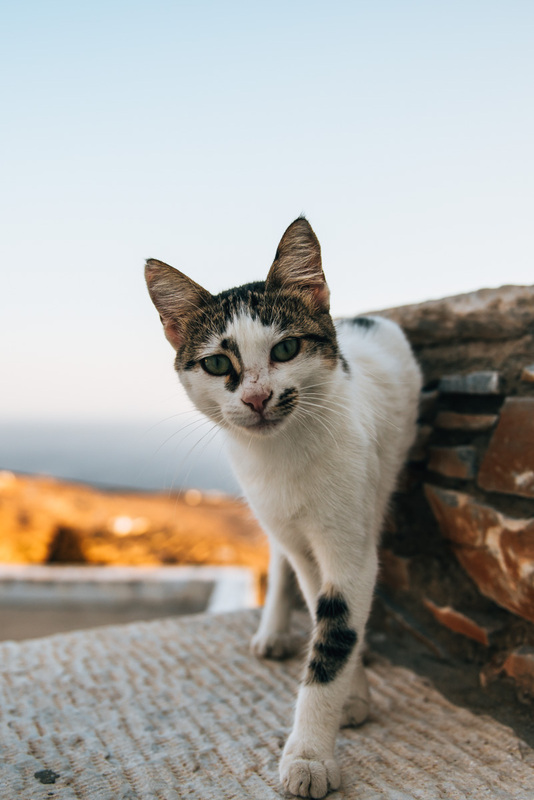 Have you been already on Tinos? Or do you have another island tip for the Cyclades islands or generally Greece? We look forward hearing about your experiences! Pretty photographs & a nice article.